Anand's challenger in the last World Championship, Boris Gelfand of Israel continued with his impressive run and defeated Ding Liren of China to join overnight leader Maxime Vachier-Lagraev. 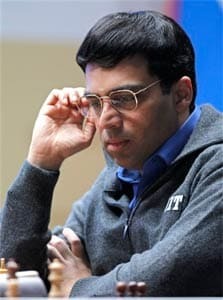 Peaking at the right time, world champion Viswanathan Anand scored a facile victory against Laurent Fressinet of France to be joint third after the seventh round of the Alekhine Memorial Chess Tournament in St. Petersburg. The victory helped Anand take his tally to four points out of a possible seven and the way it came was quite satisfying for the Indian ace. With just two rounds to come in the 10-player super tournament, Anand has one white game left against Peter Svidler of Russia and a victory in that could well mean his escalation to the top of the standings. Anand's challenger in the last World Championship, Boris Gelfand of Israel continued with his impressive run and defeated Ding Liren of China to join overnight leader Maxime Vachier-Lagraev at the helm on a day that saw two decisive games after an all-drawn affair in round six. Both Vachier-Lagraev and Gelfand have 4.5 points apiece and they are followed by Anand, Michael Adams of England and Levon Aronian of Armenia a half point behind. Fressinet slipped to sixth on 3.5 points while Russian duo of Vladimir Kramnik and Nikita Vituigov are on joint seventh position with three points each. Ding Liren is now ninth with 2.5 while Peter Svidler is at the bottom of the standings having two points. The Russian leg has augured well for Anand who started off with an easy draw as black against Kramnik before the victory over Fressinet. Earlier, when the tournament was held in Paris, the world champion suffered a first-round loss against Adams from which he could recover only in round five to enter the Russian half of the tournament with a fifty per cent score. Playing white against Fressinet, Anand came up with an early opening surprise by going for the Scotch opening. Fressinet walked in to complications and that was what Anand had in mind. A tactical skirmish in the middle game ensued in which the Frenchman was no match. After running in to rough weathers temporarily around move 25, precise calculation netted Anand a rook for a minor piece and the technicalities were no problems thereafter. The game lasted 49 moves. Gelfand grounded Ding Liren in the longest game of the day. Playing white, the Israeli got a minuscule advantage in the middle game and while looking for his counter chances Ding Liren gave an exchange sacrifice. With material to back him, Gelfand proved his true mettle and first neutralised black's initiative and later displayed immaculate technique to net the full point. In other games of the day, Michael Adams again could not make use of his resources and drew with Vachier-Lagraev, Vituigov played his sixth draw on the trot when Aronian could do little as black while Svidler played solid to hold Kramnik. Results round 7: V Anand (Ind, 4) beat Laurent Fressinet (Fra, 3.5); Michael Adams (Eng, 4) drew with Maxime Vachier-Lagraev (Fra, 4.5); Boris Gelfand (Isr, 4.5) beat Ding LIren (Chn, 2.5); Peter Svidler (Rus, 2) drew with Vladimir Kramnik (Rus, 2); Nikita Vituigov (Rus, 3) drew with Levon Aronian (Arm, 4).